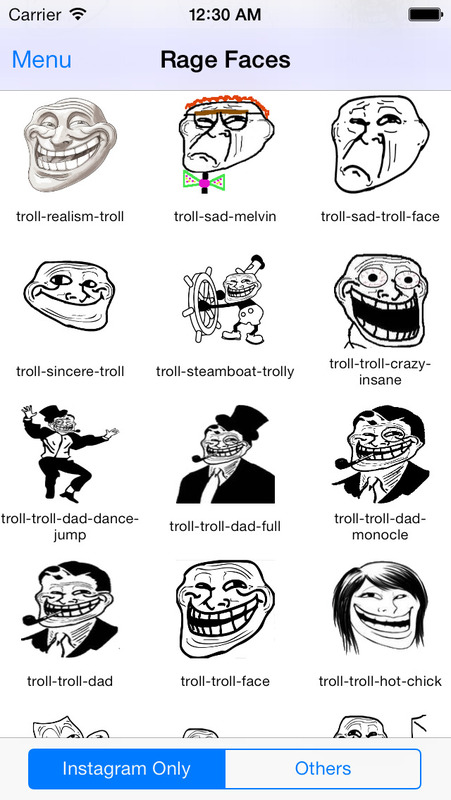 Wanna share Emoticons, Rage Faces, Characters, and Symbols with your friends on Instagram? Wanna share your Mood with your friends on Instagram? Wanna draw something with Colors and Shapes, and share it with your friends on Instagram? This amazing App allows you to send Emoticons, Rage Faces, Characters, Words, Symbols, Share your Mood, and Draw your own Sketch with Colors and Shapes, to be shared on Instagram, as well as Facebook, Twitter, sent as a Mail, Message, Saved to your Photo Library, Assigned to a Contact, Printed, or sent via Air Drop.